Asbestos can be found in many places such as, insulation, flooring, register vents, textured ceilings, duct wrap, plaster and roof shingles. If asbestos is found, a qualified asbestos removal specialist will need to be brought in to remove it, avoid disturbing asbestos materials yourself. Asbestos is a serious hazard to health when the fibers are disturbed and become airborne, asbestos poses health risks only when fibres are present in the air. Asbestos can cause serious health risks such as, laryngeal effects, mesothelioma and has been linked to lung cancer, all of these caused by the asbestos particles in the air. 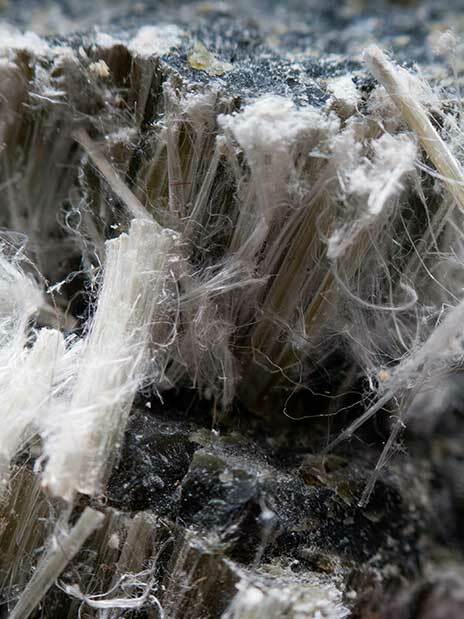 Fibres can be released into the air when asbestos-containing products break down, this can occur through deterioration or when the material is cut or disturbed. PH-Group are professionally trained, insured and certified in asbestos removal, this includes site inspections, containment of the area and proper removal and disposal of the asbestos containing material. It is important the the removal of the asbestos is done properly, throughout the removal process PH-Group sprays the asbestos materials with a binding agent to prevent the fibers from becoming airborne. The material is then removed and placed into poly bags and sealed, HEPA filtration systems are being used throughout the entire process. The first step in solving an indoor mould problem is stopping the source of moisture. Next is to remove the mould growth. The following are common steps for mould removal. The area will be contained and sealed and a clean room established. Everything that is to be saved will be cleaned with a chemicals and stored in the clean area. The mould will be treated with chemicals to kill the mould present, if possible the studding will be saved and cleaned. Air scrubbers will be placed in the containment area and help with the mould removal process. After remediation the mini pred will remain on site and containment left up. A technician will return to remove machines and break down containment. Air test carried out to prove the area is mould free. In order for mould to grow it needs moisture, the most common places for mould to grow are on damp basements, carpets and walls of kitchens, bathroom and laundry areas. Mould can be black, white or almost any colour, there are many different species if mould that come in an array of colours and textures and often looks like a stain or smudge. The mould releases spores into the air, when these spores are present in large quantities significant health risks arise, such as, wheezing and shortness of breath, eye, nose and throat irritation and allergic reactions. Once the material is exposed to water damage and isn’t dried immediately, the mould will form and spreading very quickly, within 72 hours heavy mould growth will develop. Black mould, which is highly toxic, is the most serious species of mould, it can be found in water-soaked wood, ceiling tiles, wall paneling, cardboard and items made of cotton (upholstery). It also grows on drywall and insulation, and can infest floors, walls and ceilings. The PH-Group offers expert black mould remediation or removal services, detailed testing, proper sealing of contaminated areas to prevent spreading and efficient removal methods that ensure that you are able to deal with this problem permanently and in a cost-effective manner. Our timely and extremely effective mildew mould removal service will prevent serious health issues from affecting your employees, tenants, patients or family.